Our line of office-style ethernet drop cables are the ultimate in price and performance. The ethernet transceiver cable usually connects a transceiver (connected to the Thicknet backbone) directly to a station, or to a hub. The slide lock form a dependable physical connection between cable and hardware. 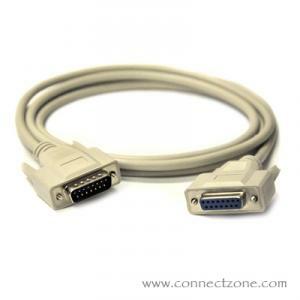 This cable is sometimes called an AUI cable because it often connects to the attachment unit interface (AUI) on an ethernet network interface card. Office-style AUI cables are known for their high level of flexibility which makes them easy to install in an office environment.